All mornings, a menu is proposed for the breakfast in the hotel. A copious buffet is served from 6:30 am to 10:30 Mondays to Fridays and week-ends from 6:30 am to 11:00 am am in the breakfast restaurant. The formula can be served in your room from 6:30 am to 12:00 am. 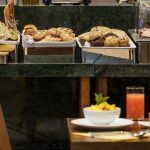 Breakfast: 14€ per day and per persons, in restaurant or in your room.